Are you a overwhelmed as you are browsing through the options of Northern Lights holidays in Finland? Don’t worry. You are in the right place to start planning your dream vacation with Auroras and gorgeous Nordic landscapes! We Finns love to catch the Northern Lights, too. As locals, we know a thing or two about Auroras. I thought I’d share the knowledge with you so that you can plan and book a better Northern Lights holiday for you and your loved ones. Because, *drumrolls*, here comes the most important thing you should know about the Auroras: There’s no guarantee you’ll see them. You plan and book right to increase your chances of seeing the Nothern Lights. But that’s the fun, the challenge and the adventure! We all have the same situation. Hunting the Northern Lights is all about luck and statistics. The prize is a memory that you’ll cherish forever. To be honest, it’s kind of difficult to put my own Aurora experiences into words. Northern Lights are such a majestic sight. Every time I catch them, they shake me to the core, in a good way. They connect me with nature, space, and divine in a magical way. I’ve collected here 15 things you should know about the Northern Lights before booking a trip. The first thing you already read. The next 14 things that follow include advice on the best locations, likelihoods, useful forecast sites, what to pack and a bunch of helpful tips. The Finnish Meteorological Institute is the source of the stats. I have updated this post in October 2018. Glass Igloos in Finland: Local’s Tips for the Once-in-a-Lifetime Experience! 1 Where Northern Lights Occur? 2 If the Likelihood is so Great, why I Might Not See Northern Lights During my Trip? 3 When Can I See Northern Lights in Lapland? 4 Is There a Best Time at Night to See Northern Lights? 5 Can Northern Lights be Predicted? 6 Are There Sites for Northern Lights Forecast in Lapland? 7 Are Northern Lights Dangerous? 8 Does the Likelihood of Northern Lights Increase with Cold Weather? 9 Do Northern Lights Make Sounds? 10 What’s the Biggest Mistake when Trying to Hunt Northern Lights in Lapland? 11 How to Catch Northern Lights in Lapland on a Budget? 12 What Gear Should I Take with Me? 14 Can I see Northern Lights when Visiting Southern Finland? Luckily, there isn’t only one location having excellent chances of witnessing Northern Lights! The best likelihoods follow certain latitudes. Generally speaking, head to Northern Lapland. The best latitude to see Northern Lights is around Kilpisjärvi. When the sky is clear on that latitude, the likelihood of seeing Auroras is 75%. So three out of four nights! I love those odds. If you are on Utsjoki latitude, the likelihood is 65%, which is still amazingly great. In Sodankylä region the likelihood is 50%. Even in Oulu-Kuusamo region, the likelihood is one out of four nights. Southern Finland has the likelihood of one night per month. Within the past few years, I would say that we have enjoyed one Northern Light performance annually here in the south. So your chances in the south are very slim. If the Likelihood is so Great, why I Might Not See Northern Lights During my Trip? The biggest reason why can’t see Auroras is cloudiness. You might not bother to go out at all and decide to sleep. But don’t go to bed! The weather changes fast in Lapland so Northern Lights may occur while you are dreaming about them. The second biggest reason is that you are not far away enough from the artificial lights. Even little light pollution prevents you from seeing Auroras. This problem you can certainly fix! Get away from the street lamps and decorative lamps outside. It should be dark around you. Last April, I saw Auroras at the center of a Lappish village in Ylläs, but I walked to a lake to avoid the lights of the village. Last spring, I couldn’t see any Auroras from our cabin window but they were gorgeously blazing over the lake! When Can I See Northern Lights in Lapland? The season for Northern Lights is from October to March. Statistically, winterly spring and autumn are the best times for Auroras. When we take into consideration cloudiness and the best averages for clear skies, there is one month that is a winner: March. That’s also the perfect month to enjoy the most beautiful skiing weather in Lapland as there is usually plenty of sunshine during the daytime. Monthly Weather Guide to Finland: Pick the perfect time for your visit! Is There a Best Time at Night to See Northern Lights? Statistically, the best time to see Northern Lights in Lapland is around midnight and some two hours before and after. So remember to stay up. Most likely you’re in Lapland only once! Can Northern Lights be Predicted? Weather predicting is still a mystery to people. As an engineer and a nerd, I think that’s fascinating! That being said, we can get some short period predictions and real-time info. Still, I do recommend just going outside and not trusting forecasts (especially negative forecasts) too much. Northern Lights have their own agenda. Okay, but now, prepare for some technical stuff! Short period Northern Light prediction is based on the fact that it takes around three days for the solar wind to reach the Earth from the Sun. From that, we can predict what the Aurora weather will be like. It’s not 100% accurate, because when the solar wind hits Earth, several things still affect the Northern Lights phenomenon. Also, bear in mind that bigger solar wind spurges reach Earth faster. So when there is going to be a huge Northern Lights event, one can alert people only 24 hours earlier! Are There Sites for Northern Lights Forecast in Lapland? I know three helpful sites. I particularly like the EU Aurora Service, because it shows a short period forecast too. These sites forecasted right the Auroras I saw last spring. However, I’ve said it before and I say it again: Go outside in the dark to double check the situation yourself. Easy map showing the likelihood of Auroras in Finland. This is real-time forecast only. You can see Southern Finland here too. This page shows a forecast for the next three days based on regions. First, check the regions from this map to see under which KP region your destination is. This page shows the forecast for the next three days based on regions. So if you see a number 3 in the forecast, it means you can potentially see Auroras if you are in KP regions of 0-3. Okay, this is the most technical site of all. It feels quite old, but it is a legitimate site. I apologize that there is no straight link for the English language version. First, change the language to English from the right upper corner. Then select Images by the all-sky cameras. These cameras monitor the sky nearly real-time. There is also a real-time forecast here, but it’s quite technical. I usually just use the cameras. For people, no. Not in anyway. Auroras are not radioactive. I’ve heard some people wondering about this. They don’t cause power cuts either in Finland. Northern Lights can harm satellites though. Does the Likelihood of Northern Lights Increase with Cold Weather? Northern lights visibility doesn’t correlate with freezing cold weather. However, clouds correlate with warmer temperatures! Usually, with more freezing temperatures, you have a clear night sky. And that’s, of course, a prerequisite for spotting any Aurora activity! That’s why it feels that Northern lights occur when it’s very, very cold. Do Northern Lights Make Sounds? At the moment of this update (October 2018), it has not been scientifically proven that Northern Lights make sounds. There is research going on and I’ll update the latest to here. What’s the Biggest Mistake when Trying to Hunt Northern Lights in Lapland? The biggest mistake is to stay close to artificial lights or indoors. You can’t see Auroras then! Be brave and head to the darkness. Preferably, find an open space like an icy lake. If you feel insecure, I recommend buying a tour. You usually get additional services, and you can try snowshoes, a snowmobile or reindeer sleigh. How to Catch Northern Lights in Lapland on a Budget? 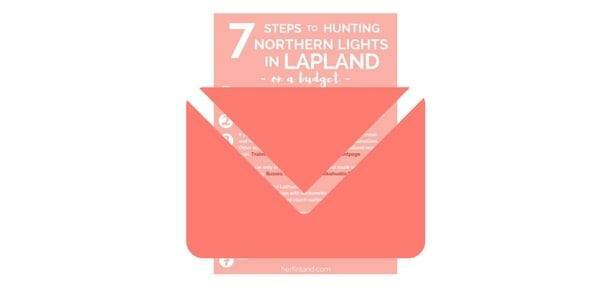 Download my Cheat Sheet on how to hunt Auroras in Lapland without breaking the bank! You’ll be subscribing my newsletters too but you can opt out any time you want. And, I never spam. What Gear Should I Take with Me? #1 Many hotels provide an Aurora alarm to their guest. However, I still recommend just going outside and not trusting on the alarm. #2 Don’t rely too much on the forecast sites. Once again, head outside, into the wilderness! #3 The human sight in the dark is not so good. Be outside for 30 minutes for your eyes to set. #4 Always check that your camera and phone are charged before going out in the winter because the freezing conditions eat up your battery fast. At least we Finnish ladies keep our iPhones inside a woolen mitten or sock to help the battery last longer. #5 You cannot take a photo with your phone (it’s just too dark), but it’s a necessity if you get lost. #6 One-time heat pockets are one of the best innovations ever to be comfortable in cold temperatures! Usually, your hands or feet get cold no matter how prepared you are. These are perfect when the situation gets desperate. Here are all my winter clothing tips for Lapland! #7 Ladies, remember to check the Beauty Essentials of cold weather to avoid skin problems and makeup failures. #8 Have your own car so you can stay as long as you like and get back to warmness as fast as possible! #9 Seek for dark but open places (for example, a frozen lake). Northern Lights may occur near the horizon. #10 Be sure to know where you are. Don’t go too deep into the forest or you might get lost! Can I see Northern Lights when Visiting Southern Finland? Well, you would be really lucky if you spot them. It’s not impossible, though! To check the situation, the Finnish Meteorological site offers a 3-day forecast for Southern Finland. This service is available from autumn until spring. Unfortunately, it is only in Finnish. As a conclusion, Northern Lights are unpredictable. That’s the essence of Northern Lights Holidays in Finland! So, head outside, every night and make the most out of your vacation. It wouldn’t be an adventure if seeing Auroras was a sure thing! Download here the Northern Lights Hunting on a Budget – Cheat Sheet for my local’s tips on how to see Auroras without spending a lot of money! You’ll be subscribing my newsletters too but you can opt out any time you want. I never spam. I hope this guide was helpful! I wish that everybody having their Northern Lights holidays in Finland would have the luck to see Auroras. Is there anything else you’d like to know about Auroras? Are the Northern Lights on your bucket list? Let me know in the comments! Auroras are always of interest to us in Alaska as well, so here’s another aurora forecast link that works well for us and also shows predictions for all the northern hemisphere including Europe and Finland:https://www.gi.alaska.edu/monitors/aurora-forecast. Click on the Europe map icon to get a larger view. Also to the right of the forecast map, click on the NOAA space weather site to show an animated 24 hour forecast for the northern hemisphere in UT (universal time). One more option to track those tricky auroras – enjoy! There are many other science sites that also report on the sounds, which do happen. Thank you for opening a great discussion topic! The Finnish Meteorological Institute is my source on this blog post. I had the opportunity to discuss with them about this linked article and other articles I found on the web regarding Auroral sounds. The reply was that the hypothesis has not yet been verified, and further research has to made to back it up.